I’ve become aware that the president of the National Down Syndrome Society (NDSS) is sending out a form email to community members who have expressed concern or frustration about NDSS’s approach to healthcare legislation in Congress. The American Healthcare Act (AHCA) and the Better Care Reconciliation Act (BCRA) have both contained efforts to scale back consumer protections, as well as cut hundreds of billions of dollars from Medicaid by imposing cap and grant systems. These changes would be devastating to the disability community. I’d like to present this form email, with my own notes and observations, shown in blue. I hope to facilitate a critical reading of what is (or isn’t) being offered in this email, as well as constructive suggestions for what NDSS could be doing in order to avert devastating harm to our community. As the president of the National Down Syndrome Society (NDSS), I want to personally thank you for expressing your concerns and follow up. First and foremost, I have no political affiliation. Very simply, my political party is NDSS – let me say again, my political party is NDSS and everything we do from an advocacy perspective is to fight for those in our community. Board members Robert Taishoff (Chairman), Charles H. Gerhardt III, Gordon Spoor, Jim Nussle, and Charles Symington have all donated sizeable sums to Republican politicians and groups. Clicking on each board member’s name will show search results from the Federal Election Commission website. Mr. Symington’s professional history seems particularly suited to helping us. In addition to his sizeable political contributions (and hopefully connections), he is the Senior Vice President at Independent Insurance Agents & Brokers of America. I found this video in which Mr. Symington discusses the process of passing healthcare legislation with great familiarity. Mr. Gerhardt is the President and Founder of Government Strategies Group. His bio shows quite an impressive history of working with Republican lawmakers. 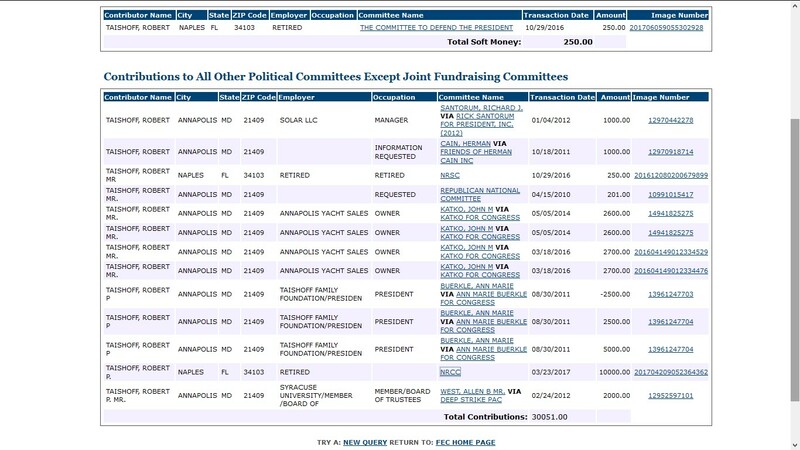 Vince Randazzo, NDSS Policy Advisor, has also donated extensively to Republican causes. Mr. Randazzo’s bio also shows a long history of ties with the Republican party. Ginny Sessions, former Grassroots Advocacy Manager, is the daughter of Republican House Representative Pete Sessions. Sessions voted yes on the AHCA bill. Sessions also has a child with Down syndrome. c) She is deliberately obfuscating the details of NDSS’s stance. Unfortunately, we are in a very tense political environment and I understand the passion you possess on a number of issues. However, I want to make sure that I respond to you directly regarding your email and the blog post by Ms. Meriah Nichols. Ms. Nichols can question my leadership and the direction of our organization, but I am disappointed she decided to attack our advocacy staff concerning our work. These claims are mutually exclusive. Leadership and direction of the organization and the resulting work of its staff cannot be separated. Ms. Weir could theoretically be implying that she has no decision making sway over what her advocacy staff says or does, but that would be not only doubtful but of grave concern. I have personally reached out to Ms. Nichols a number of times and invited her to come to DC, which she did not respond to those efforts. However, we did make contact about meeting in California, and I am hoping we can meet at a convenient place for both of us to discuss in her home state, or at the very least talk so we can all work together for the betterment of our community. Ms. Nichols made the emails between herself and Ms. Weir publicly available. No one has told me that they specifically named Ms. Nichols in their emails to Ms. Weir. Rather, their concern was about NDSS and healthcare. c) NDSS was comfortable speaking to McConnell’s staff in generalities only. The reader does not get information about the substance and outcome of that meeting, or what it means to keep Medicaid “harmless.” Let me be clear, any changes to Medicaid negatively are fiercely advocated against. Pay close attention to word choice here. This sentence leaves room for the possibility that there are some changes to Medicaid that may be acceptable. Yet the reader is not given a firm definition of “negative” change, or what might constitute “fierce” advocacy, or who might perform such advocacy, save for a single meeting with Mitch McConnell’s staff, results unstated. The reader is left with an emotional appeal: I won’t let anything bad happen to you. Summary: Opined that the House bill was unlikely to pass (it did), but encouraged families to oppose the AHCA. Did not make a statement on NDSS’s formal position. Summary: Largely the same as the April 14, 2017 alert. Summary: Outlined concerns regarding the AHCA. No statement on NDSS’s formal stance. Note: Two co-chairs of the Ds Task force (McMorris Rogers and Sessions) voted for the House bill. 15 additional Representatives from the task force also voted for the bill. Summary: Encouraged people to contact members of the “ACA Task Force”, and specifically detailed LTSS (Long Term Supports and Services), HCBS (Home and Community Based Services), pre-existing conditions, and EHB (Essential Health Benefits). Summary: The May 10, 2017 alert is recycled two more times. Summary: Outlines key areas of concern for BCRA. Earlier in this email Ms. Weir reports that she met with McConnell’s staff two hours after the release of the bill. This action alert took 3 days to appear on social media and is dated 4 days from the bill’s release. The day the bill was released, NDSS posted on its social media about education instead. Still no formal stance. Of general note: There are 7 alerts listed here, three of which are identical; that is far fewer than other legislative efforts, such as the ABLE Act. One of our key legislative priorities is (and continues to be) ACA and Medicaid. Our team had been actively meeting with Senators and staff on Capitol Hill since the House marginally passed their version of ACA. Again, ACA passed in 2010. Again, I note the absence of any information about the content of the meetings. NDSS believes in direct advocacy and engagement with key decision makers as well as having individuals with Down syndrome and their families as part of our important discussions. There is no publicly available, substantive information regarding meetings with “key decision makers” that NDSS has had with or without self-advocates and their families. Aside from its alerts, NDSS has not posted on social media about any of its advocacy efforts concerning healthcare. The most impactful advocacy strategy is to tell your personal story as our KY advocates did last week to Senator McConnell’s staff. NDSS wants to work with our community to help tell stories and advocate. If we work together, we can affect policy positively and much more powerfully. Working together would logically include joining with other disability groups’ efforts to fight the bill, which NDSS has not done. I want to personally invite you and your family to join me in Washington, DC for our next round of Senate meetings, following the Fourth of July recess, since the vote has been postponed. If you cannot come to Washington, we are happy to help arrange in-district meetings where myself of one of our fantastic NDSS staff members can help arrange. Even more, even if it is a phone call to a Member of Congress and/or a letter, please respond back to me and let me know how NDSS can help. At this crucial time, I want all of us to be working together. This is a blanket invitation to those expressing criticism or concern regarding NDSS policy, rather than a coordinated effort to gather community stakeholders. NDSS will continue to meet with Senate Leadership and Congressional staff to advocate and educate them on our serious threats to individuals with Down syndrome in the current Senate ACA framework. Once again, Ms. Weir states that her concerns are about the ACA, rather than AHCA and BCRA. NDSS will make all your travel accommodations and other necessary arrangements. Again, thank you for your tireless advocacy. I look forward to hearing from and working with you in the future! As a backdrop to this post, I want to direct readers to the most recent NDSS financial statement. In January 2016, NDSS entered into contract for sale of its New York office condominium for $6,200,000. Down syndrome families themselves provided over half a million dollars in revenue that year to NDSS through Buddy Walk fundraising. NDSS spent $342,799 in the area of “public policy.” Surely, these kinds of financial resources would enable NDSS to plan and enact a more robust public policy effort against the AHCA and BCRA? Yet, as of this writing, I cannot find a staff position naming “public policy” at all on the NDSS website’s staff directory. I would like to see more than a handful of action alerts and some assurances that a meeting occurred, without any information about the substance or outcome of that meeting. A series of concrete steps could not only alleviate some of the Down syndrome community’s fears, but bring us closer to our common goal: preserving the future of healthcare and Medicaid for our community. GREATER TRANSPARENCY: NDSS has claimed to have had multiple contacts with “key decision makers” in regards to the issue of healthcare. The community deserves to know the details of those meetings. Who is present? What is the message? What tangible results may come from these meetings? Sharing these details with the community can only help engender greater faith in the organization. COLLABORATION: NDSS has not joined forces with our own National Down Syndrome Congress (NDSC), or any other disability groups on the issue of healthcare legislation. Not only do the optics of this non-collaboration look terrible, but it simply does not benefit us to have our “leading human rights” organization as a solo player at a time when strength in numbers is essential. COLLECTING HEALTHCARE STORIES: NDSS can leverage its social media presence to boost our community’s stories, as well as teach people to share their stories locally. Some ideas: toolkits for local action that outline how to write letters and opinion pieces for local media outlets, collaborating with Congress members who are also collecting stories, and coordinating meetings with Republican Senators to meet constituent families who will directly be harmed by AHCA and BCRA. COORDINATING RALLIES AND TOWNHALL ACTION: Physical presence is powerful, but it requires organization and planning. Rallies and townhall meetings are covered by media outlets and provide a crucial method of visibility and are very effective methods to pressure elected officials. PUBLIC POLICY ANALYSIS: Let’s face it, healthcare is complicated. The average community member cannot write his or her elected officials with substantive comments on legislation, nor does the average person have an equivalent to NDSS’s platform. Public policy analysis is regular practice for many advocacy groups. Their paid staff members analyze policy and legislation and send letters to the appropriate political figures or bodies. Constituents can then plainly see their organization’s stance, as well as benefit from its professional analysis. Often, organizations are then invited to testify and participate in the legislative process. WHAT HARMS ONE, HARMS ALL: I note with anxiety that Ms. Weir’s language leaves quite a bit of rhetorical room for supporting “carve outs.” Carve outs are exemptions from the cut and cap system being currently proposed. They will not work. A $772 billion dollar cut will be so devastating that no exempted group will avoid harm. This is akin to telling a family that it must now live on half the amount of money for food, but in theory, one of its children can eat as much as they need. With half the money, the family simply cannot buy enough food, period. Facing drastic cuts, states will have no choice but to scale back on optional Medicaid services such as prescription meds, therapy, home-based support and prosthetics, to name a few. If a state does not offer a service, it does not matter whether a group is exempt from the per capita cap. The service simply won’t exist. People in states with already long waiver lists will languish indefinitely. The current carve out is for medically disabled or blind children, only. Children grow up. Lastly, this method pits different parts of the disability community against each other. Who is more important? Children? Adults? Physically disabled? Intellectually disabled? Is it more important to reach more mildly disabled people, or fewer severely disabled people? You can read here and here and here about why carve outs will not work. Ask NDSS not to support carve outs. STRONG AND CLEAR STANCE: To date, I have not seen NDSS take a clear, official position against either the AHCA or the BCRA. Repeated reference to the ACA in the above email and action alerts is confusing and risks dampening the community’s advocacy focus. Advocacy organizations regularly craft public position pieces on issues facing their communities. NDSS should do the same. A strong, clear stance can not only protect NDSS from unnecessary criticism, but also give the community a unifying rallying cry. AHCA and BCRA might be the biggest, and worst, things to happen to the Down syndrome community in decades. Our social safety net is being unraveled at an alarming pace. Fortunately, it is not too late. It time to think critically, speak loudly, and rally together. Right now. 50 years ago, New York Times writer William Petersen wrote an article titled “Success Story: Japanese Style” and in it, coined the term “model minority.” Today most of us know what this term means, but in case you don’t, here is a fairly good history of the term and its social and political impact for the last half century. What I don’t think many people pause to consider is that the model minority myth did not flourish because it was true, or that Asian Americans fully embraced it, but rather because it was beneficial to the racist status quo. Who was writing about the model minority? In 1966, not Asian folks. More importantly, for whom are we modelling? I think there are valuable lessons here when we consider how disability fits into the mainstream narrative. What does it mean to “overcome” one’s disability? Or to proclaim that we are only disabled in attitude? Or to applaud examples of average daily tasks as inspirational or against all odds? 50 years since its birth, the model minority myth is not exclusive to the AAPI community. This kind of narrowly elevated yet not equal status is a tool used against the disability community as well. In the Down syndrome parenting world, this manifests as pressure for us to “catch more flies with honey” (i.e. Don’t sound too angry or the discrimination your child faces is your fault) or to be thankful that our children are labeled with positive rather than negative stereotypes. It is true that yelling and screaming at an IEP meeting will likely not get ideal results. Yet, is the frustration invalid? Why does a parent “breaking nice” relegate a child to fewer educational rights? A bigger question: What does it mean to have IEP proceedings (and its required assessments) for only some children and not all? It is also true that cursing the person at the grocery store who used the r-word is unlikely to make them engage in a meaningful discussion of word choice and ableism. Yet, again, is the frustration invalid? A bigger question: Whose responsibility is it to maintain kind and just behavior? Regarding positive stereotypes,yes, I suppose I would rather my son be approached with a smile under the mistaken belief that he is “always happy” than he be actively shunned. Sadly, it doesn’t work like that. Because by definition, a stereotype is not something any human being can fulfill, all positive stereotypes lead to failure. In failure, we see the racism or the ableism for what it is, because the penalties for failure are steeper for the model minority than for his other peers. Growing up I learned to be very wary of men who were romantically interested in me for being Korean. On more than one occasion I have feared for my safety after disappointing a man by not being a submissive “good girl.” Ethan Saylor suffered the fatal consequence of not living up to this model minority phenomenon; three years ago, Saylor died at the hands of the police after failing to be docile or sweet after a miscommunication in a movie theater. These two examples seem wholly unrelated, but I believe the commonality is powerful. Both are examples of how physically and emotionally dangerous it can be for the majority to dictate the attitudes and behavior of a disenfranchised minority, however “positive” those expectations can seem. As we strive for a more inclusive society, I think there are valuable lessons in the model minority myth for parents in the disability community. Whose standards are we raising our children to fulfill? What is good for us, the parents, and what is good for our children? What do we do when our interests as parents seem to conflict with our children’s? How could our narrative today impact our children tomorrow? Hey, before I start: I got an early copy of this book to review, ‘kay? Okay. I think that most parents who have a child with Down syndrome remember cracking that first informational book or pamphlet. I also think that the parents who recall that moment with any fondness are in a minority. When I started really believing that LP had Down syndrome (but before we got any test results back), I went to the library and borrowed every book I could find with the words “Down syndrome” in the description. I’ll confess to you: I flipped through those books and never finished a single one. I was like the Goldilocks of T21 books. Too sad. Too technical. Too saccharine sweet. This one freaks me out. This one is just offensive. Nothing was quite right, and I gave up. So I went online, met a bunch of other mamas, totally ignored my husband for a few months, forged some lifelong bonds, and moved on. I still wonder what would have happened to me if I’d never found those connections, and had stopped at that terrifically unsatisfying pile of books. Would I have had a harder time bonding with my baby? Would I have the support network that I have today? What would my overall view of disability been? And the fact is, all across the country, parents are being passed those not-quite-right resources every day. 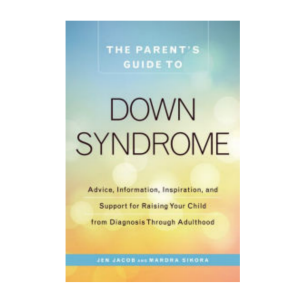 Genetic counselors, pediatricians, OBGYNs, even well-meaning family members are purchasing and distributing books on Down syndrome. Yet, I have never read a comprehensive book that was actually written for parents, by parents, that I liked, until The Parent’s Guide to Down Syndrome. It covers the medical nitty gritty without being overwhelming and holds your hand through the emotional parts, as well as covers a wide age range. This book could very well be the only book that a parent could purchase; it is full of resources and can be treated as an index to keep returning to as your child grows. It makes very little sense, actually. What is a doctor going to be able to tell you when you are in that raw, tender moment that could possibly equal the words from someone who has gone through the same moment with their own child? Of course there are good doctors, don’t get me wrong, but what makes the strongest, truest connection is usually someone who has had the same lived experience as you. And yet often I found that the parent books were hard to relate to because they held views that didn’t speak to me. Much of the book reads like a coffee date with a hundred or so other parents (another disclosure, I’m one of those parents). In there, you’re going to find a voice that resonates. And I found myself recognizing parts of my own metamorphosis; I saw my initial holy-wow-can-this-be-true self, that changed to the my-kid-is-the-best-ever-forever-and-ever self, that changed to the oh-crap-I-guess-I-should-plan-a-little self, and on and on. I imagine that someone could read through all of the accounts and truly see the overarching path that many parents take, and notice that we mostly end at the same place—love and acceptance—without falling into the single experience of just one person. Between the real experiences, you’ll find a ton of resources that span infancy through adulthood. That’s where the professionals come in, and hey, they might be our frienemies but we like to hear what they have to say every now and then, right? The topics and chapters are laid out very well, so a reader can go in and get information on specifics if they wish. I certainly wasn’t very interested in trust planning when my baby was four months old, for example. Most importantly, the book does not sacrifice values at the altar of neutrality. Sometimes I think in an effort to be neutral, our parent community has an “everything is equal and valid” kind of presentation, and that can be dangerous. Instead of doing that, this book takes pains at crucial points to steer the tone and meaning away from possible stigmatizing language and ideas. The book recognizes that we are all human with the same basic needs and desires while also acknowledging that people with Down syndrome may have certain needs due to their particular disability. It isn’t going to give you step-by-step instructions on your kid. It won’t tell you what to do, because the authors know that there is no singular path for any child, let alone a child with Down syndrome. But it will give you a decent atlas, if you will. Like, What To Expect When You’re Expecting sort of book geared towards topics specific to Down syndrome. And now I come to my favorite part: the voices of people with Down syndrome! I was so pleased that the later chapters that cover adult topics actually had… Yes! Adults with Down syndrome sharing their lives! I can’t overstate this: I will never know what it is like to have Down syndrome. At some point in my son’s life, he’s going to have to find his second family, among other people with intellectual disabilities. This book starts that conversation for new parents so they can read the words of other adults and have a glimpse into their children’s (wonderful) futures. Image: The Parent’s Guide to Down Syndrome book cover. Blue fading to yellow/orange with blurry sparkles in the background. If you’re a parent in the community, I’d highly recommend buying a copy of this book at sending it to your OBGYN or pediatrician, as well as your local Down syndrome organization. Or, better yet, hop on over hereand enter in a really fun giveaway. The prize includes an “I love someone with Down syndrome” tote, fun stickers, a registration to this year’s 321eConference, other book resources, and of course, a copy of The Parent’s Guide to Down Syndrome. You can read more about the book here, including where to purchase and book tour details.